Lesson – Honor those who came before you. I hate being predictable, but I do love watching horror movies with my favorite actors in them. It is slightly strange that this is the second time I’ve watched a remake intentionally because of an actor, but hey. This is America. Also, Jensen Ackles. 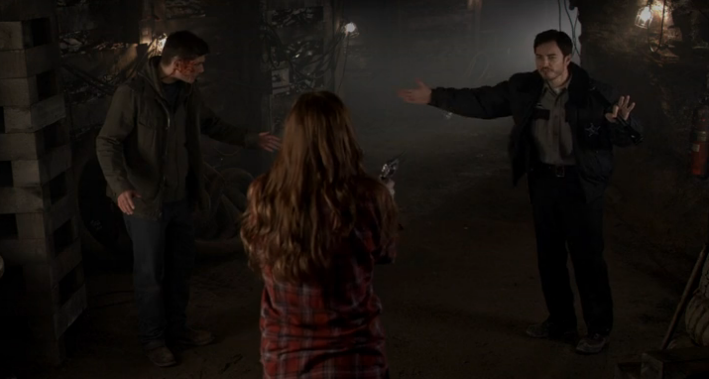 Coincidentally, Jewel Staite guest starred on “Supernatural”, starring Jensen Ackles. That being said, the opening credits are SO COOL. Coolest in any movie I’ve watched for this column. Let’s chat about plot changes. There are some that work, but also some that are weirdly ineffectual. For instance, the town is no longer “Valentine’s Bluffs” but is now “Harmony”. The significance of Valentine’s Day is just that it was when the accident happened. Also, twist, now it was Tom’s fault (T.J.). The dynamic of friends changes a bit, but I think that it gets a necessary contemporary update. Tom has a reason to leave town – his negligence killed someone. He failed miserably and comes home to sell the mine. Old flames flare, etc. Axel is still with Sarah in the future because Tom left, but this time it’s been ten years, and they have a kid. Also Axel is cheating on Sarah. This movie is crazy bloody, as any good slasher flick should be. That up there happens before the five minute mark. Actually, the middle of the movie is a tad stale. There are plenty of throwbacks to the original throughout, though, including deaths and such. The references are well done, and executed in a timely manner. I thought the washer homage was particularly well done because it fit the plot precisely, but was really almost shot for shot. This movie features one of the best clotheslines I’ve ever seen. All in all, I thought that this movie was exactly what it set out to be. 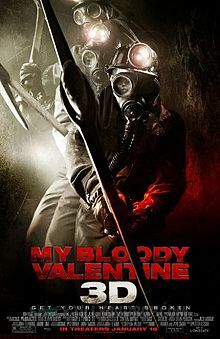 An updated My Bloody Valentine with some good old 21st Century modernization. If you read my column regularly, you might have realized that I am particular about my homage/remake/references, but I think that this film does it with tact and grace. Speaking of which, the twist is different. I don’t really want to elaborate further, because I don’t want to ruin the surprise. It is good though. It kept me guessing, and genuinely confused for a while. Basically, I enjoyed this movie. It was engaging and active. It was silly, because, y’know, slasher flick, but it was entertaining in the good way. It was weird to hear Jensen Ackles curse. The Sarah character was a little weaker, and this movie sort of pulls the same ’empowered woman with a weapon’ crap, but I can’t really complain too much. I don’t recall much in the way of ‘jump out of your socks’ scary, but it was intended for 3D audiences, where the pickax was in your face the whole time, so I suppose some of that was lost on me. While finishing up my notes, I caught this in the credits. Enjoy.